Break on HTML mutation feature has been introduced in an article Dynamic and Graphical Web Page Breakpoints submitted to WWW 2010. There are three types of mutation events. Let's go over three simple examples that explain how to use the feature and how it can be useful to web developers. Each example is available live on this page and so, you can just open Firebug UI (or install Firebug) and try it out immediately. 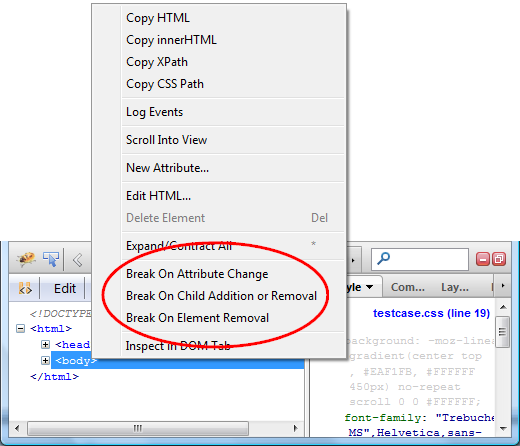 The first example shows how to break when an HTML attribute changes. Firebug debugger breaks JS execution showing you the line of code that caused the change. Let's see how to quickly find the code that is responsible for removal/addition of child elements. The last example show how to handle HTML element removal. Check out all Break On... events available in Firebug. thats a really cool round up 🙂 Great post. This is a new thing that I learnt reading your post..Thanks for sharing..